Take a break from the city and head to Nature & Wildlife Tours and Mindil Beach. Satisfy your inner culture vulture at Defence of Darwin Experience and Museum & Art Gallery of the Northern Territory. Get out of town with these interesting Darwin side-trips: Berry Springs (Territory Wildlife Park & Crazy Acres), Litchfield National Park (in Batchelor) and Litchfield National Park (Wangi Falls, Magnetic Termite Mounds, & more). Plan for a day of cool, family-friendly fun on the 29th (Mon) at Darwin Waterfront. Spend the 8th (Thu) exploring nature at Mary River National Park. There's much more to do: get engrossed in the history at Darwin Aviation Museum, admire the natural beauty at George Brown Darwin Botanic Gardens, look for all kinds of wild species at Crocosaurus Cove, and get some thrills on the water with a speed boat tour. 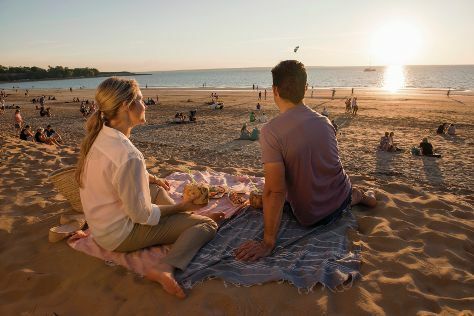 For traveler tips, reviews, where to stay, and tourist information, you can read our Darwin tour itinerary builder tool . If you are flying in from Austria, the closest major airport is Darwin International Airport. July in Darwin sees daily highs of 36°C and lows of 22°C at night. Finish your sightseeing early on the 11th (Sun) to allow enough time to travel back home.